Email logging was added in three parts which I’ll quickly cover below. Firstly adding the mysql script that creates the table, and then the related objects. This is where the emails are stored. Secondly adding an event which fires each time an email is sent and then listening for that event in a logging observer. 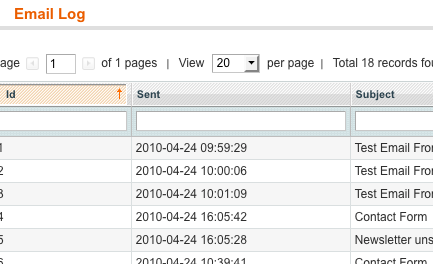 Lastly adding an Admin interface to Magento that can display the emails in the table, and allow you to drill-in to them to see how they looked when sent. 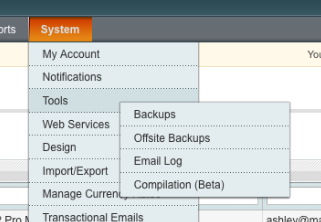 The new Magento email log menu option - the observant among you may notice another little gem in this screenshot, stay tuned! You can see the details of an email as it was sent. I’d really like to hear from any developers who with suggestions on what events they;d like in order to make email related extension development easier. I know for example in the past my extensions have clashed with some of Fooman’s extensions – hopefully adding events like this will allow us to work through the incompatibilities. Too easy eh? I would really appreciate any feedback from those of you who give this extension a try. Thanks Luis – what a moron mistake, I’ll blame the bumpy train ride! 1.1.1 is released with the fix. Updated in the post. Your work is very useful for we and the community in general. Hi, your module looks great. I’d like to try it out but I’m stuck at rather basic problem: How to install the release without Magento connect manager? I just hope that only way isn’t using System > Magento connect > Load local Package as it throws en error related to permissions. I don’t think you can use load local package, certainly I’ve never heard of that being used for installation. I’ll write up a quick 1050 minute blog post on how to install, seeing as it seems to be a hurdle for a few people, and this Magento Connect upload issue doesn’t seem to be getting fixed for me anytime soon. Done – here’s your guide to installing a Magento extension manually with FTP or SSH. Let me know if that helps. Welcome to the world of Magento! That’s normally always a hosting problem, I’d suggest you forward that error to the hosts tech support department, they’ll know what it means. If they don’t, rethink your magento host! Just installed this on my 3rd site, and it worked like a charm. This is easily a must-have extension for any Magento installation. It really should become a part of core! Just installed version 1.1.2 of your extension on magento 1.3.2.4, but am getting a 404 error on the admin url /admin/smtppro/log/index/ (System-Tools-Email Log). Any help? Can you confirm you have logged out and in again, and cleared cache? I just installed your latest version of the module in our 1.4.0.1 store and for some reason it completely killed the whole site, back and front end. I tried clearing the cache, logging out and back in to admin, but nothing helped. What was strange was, it acted like it wasn’t allowing even the .htaccess file to load before the site loads. I just get a blank screen on both front end and back end. Any ideas? I really need to get this working, our store is not sending any invoices, orders or anthing. Hi, Daniel – flick me an email with more details, I can take a quick look. Hi, That error normally means you have used the wrong password or something. Try logging in using the google email web interface to clear the error – it should present a captcha to make you prove you are human. I understand it’s a security measure to stop people trying to brute force break the email account password via the SMTP server. Hi Ashley, your module does not work. Installed it by FTP and it does not appear in admin, I found that you made error – in your sql/smtppro_setup/mysql4-install-1.1.0.php but the module version regarding etc/config.xml is 1.1.1 ?!? I changed this config.xml version to 1.1.0 but it still does not appear in admin. You better test your works before any releases. 1) In your magento database run select * from core_resource; and tell me what version is reported fro record with code: smtppro_setup (if any). Let me know the results and I can help find what is wrong. I just installed this extension myself today for a new store I’m working on, it worked fine on Magento 1.4.0.1. I have to be honest, my default solution to any email related problem is to ditch your webhost’s email and just go get a Google Apps account for your domains email – Google’s solution provides consistently excellent service, features and interface. Otherwise, you really need to get support on that issue with your webhost. The extension is just using standard SMTP to send emails, should not require any special configuration. Let me know if that helps. Yes, I did log out and in again, and cleared the magento cache too. As soon as I try to access the email log or run the smtp-test I receive an 404 Page not found error. Can you tell me what URL it is trying to take you to? It sounds like something wrong with the controller setup, if you can see all of the admin configuration options ok. Thanks for this awesome piece of software. I really like the logfunction to check what my Magento webstore has been doing. But…can you tell me how to clear the log (I did a lot of testing which I want to clear from the log)? Thanks in advance. Best regards, Erik. That’s a missing feature really – right now you could do it by deleting the entry from the logging table: smtppro_email_log. Have fun, be safe with those sql queries! Wish I’d found this site months ago! Most impressed. as it just deletes then recreates the table, rather than removing the contents row by row. Any related indexes are cleaned up too, so the end result is cleaner. Noted and updated – Thanks for the tip. Just checked out your blog too, some more good tips there by the looks. Will read it when I’m next on the train! really nice extension. I got it to work on only one of my sites. The site which is not working, is hosted on a linode host. I installed magento 1.4.0.1 just today from scratch, it’s working fine. When I install the extension, I see it in the admin interface, but settings are not saved, although I get a message that settings are saved OK.
Any idea where I can look ? Hi, Edwin – I haven’t heard of that happening before – is your database saving other settings correctly? Hi, clockman – that’s strange, can you send me a screenshot of the error, it sounds like it might be an error that ends up in the var/report directory of Magento, but I’d need to see it to be sure. If it is, find the corresponding file in var/report, and send the contents – it’ll help us to find out what is wrong. i fixed that. i reinstalled the extension and thats ok now. Howdy – I’m getting 404 errors as well on the self test and on the admin page. This looks great – any thoughts? @Matt – Try fiddling with the ‘add store code to urls’ setting in Magento – people have reported that seems to cause 404’s. I haven’t had time to investigate it myself yet. Also, no js changes at all. Thanks Ashley — can’t do it as I’m multistore with a common checkout backend and that option is required to keep the carts working straight for some reason. If you ever figure it out let me know — great work and cool contribution! Just wanted to say thanks for this, made life a lot easier this morning. I had the same problem as Matt (404s on the self test, under Magento 1.4.0.1).Setting System->Config->Web->Add Store Code to Urls to “no” fixed it. Somehow, email logging is not working anymore. Last it logged something was 2 weeks ago. What could be the reason? We are running Magenton 1.4.2. Rahul, did you install any new extensions? Maybe something is clashing? Well, we have lots of modules running on our shop. How do we get to know whether there is anything clashing? 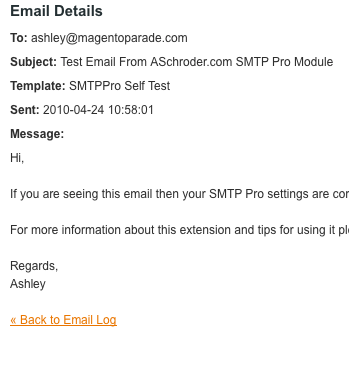 How can i hook event before smtppro send email? 2. I got the a well known problem with the tool/email log, 404 not found. And doing the sysem/config/web/Add Store Code To URL to NO, resolve the problem. gives error msg –page not found…show my host default page. i am getting a 404 error when i try to access the admin login with your latest version. First of all. Great extension. So helpful! One problem thought. I need to have “Add Store Code to Urls” set to yes, which means that I’m getting a 404 when accessing the log. Any news on a bugfix? Oh sh**, XML is not possible in comments 🙁 Just copy the “frontend” part in the config.xml, change “frontend” to “admin” and “standard” in the “use”-tag to “admin”. Thats all..